You are here: Home » Reviews » My Norwex Journey–The First Look » Norwex EnviroCloth Review–Why Our Whole Family Loves It! Norwex has turned out to be a great adventure so far. We got our consultant kit and tried everything in it. We loved it so much that we ordered more items. I will do my best to review each thing: the good, the bad, and the bottom line. The EnviroCloth is the product that started Norwex. 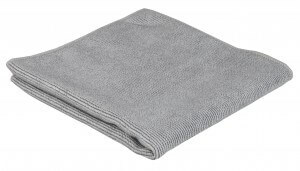 It is a microfiber cloth that has a TON of technology in it. First of all, microfiber has to be no thicker than 1/6 the size of a human hair. Norwex takes it tons of steps further than that! The microfiber is 1/200th the size of a human hair. One EnviroCloth has enough microfiber, when stretched out, to reach from Mexico to Canada. That’s a lot of microfiber! Since there is so much and it is so thin, there are a lot of micro loops throughout the cloth. This enables the cloth to hold seven times its weight in water. It also allows for dust and particles to be trapped inside the cloth when you swipe instead of moving particles around. There is also a claim that the cloth itself is able to remove 99.9% of germs from a surface. And because of the structure of the microfiber, there is no possibility of cross contamination. This blows my mind and changes my thinking. The BacLock silver technology also allows the cloth the be self-cleansing–preventing the growth of bacteria, mold, and fungus. In the following, I will tell what I have found through my own use and research. I hope that this is helpful to everyone. When I try to think of the good things I have found about this cloth, I have to really try hard to organize it all! I’ll try to sum it up with just a few examples of how we used it. Cathy and I were in our kitchen talking to a friend of ours. Of course, since we’re consultants, we talk about Norwex (or at least mention it) whenever we can. You never know who is already a fan or who would really like hearing about it. Cathy mentioned the EnviroCloth and got out a catalog. While the two of them were talking, I got an EnviroCloth, wet it with tap water, and started cleaning surfaces just casually. At first, I just wiped off the counter (I would usually do this with a sponge and dish soap). It got up all the crumbs and spills like I thought it would. I was pretty impressed the way it looked. I then used the same cloth on our stove top. Our 13-year-old has taken to cooking on the stove and not really cleaning up after herself, so there was a good amount of grease, crumbs, and spills on there. It came right up with ease! (it is mounted over our stove, so it provides a light, vent, and timer). The vents hadn’t been cleaned in a while. The grease came right off! So, I continued down to the microwave door (inside and out). It is now spotless. Then I cleaned our Keurig with the same cloth! After all this, I smeared butter on a picture frame. Then I had our 13-year old clean it with the same exact EnviroCloth (using just water). It not only cleaned off the butter, but it left no streaks when followed up by the Window Cloth! After all this, our friend did some as cleaning as well, just to try it out (even after the butter). Immediately, he placed an order for the Basic Package. You’re never supposed to wipe up raw chicken and anything else with the same cloth or sponge, right? Well, with Norwex, you don’t have to worry about that anymore. It’s a little weird to think about, I know. But there is proof. I haven’t gotten the swabs to do this myself, but I’ve seen this done. This is an example of a “Raw Chicken Test” done with the Norwex cloth. I’ll replace this with my own video once I get my own swabs. I don’t think I have to say much else. What do YOU think? Well, these aren’t really “bad” things per se. They are merely inconveniences to people who are just getting into the product line. They are more precautions or different ways that you have to do things when using these cloths. Don’t use any chemicals with the cloths–this clogs them up and makes them ineffective. Don’t use bleach or fabric softener when washing the cloths. If you feel the need to use a cleaner with the cloth, you have to use something with no fillers. Norwex offers one. The cost (but since you don’t use cleaning products, they pay for themselves rather quickly). We have saved money by using EnviroCloths last month. Okay, I can’t really think of anything bad to say. You should just order one or explore! Facebook. I only say this because sometimes we have online parties that give better benefits than just ordering online. Order online. If you really want to just order, you can by clicking the link to the left. The SafeHaven Package $151.99–A large package that contains many products–click the link for details. The Have It All Package $392.99–The name says it all. If you want to make the complete jump. This covers Laundry, Kitchen, Floors, deeper cleaning, Dusting, Washing Produce, Washing Dishes, Scrubbing Pots, etc. The Just Add Water Package $255.99–All you need for Laundry, Kitchen, Floors, and Dusting. Have any questions? Give us a buzz. You can leave a comment below, email at raphael@simpleseniorhealth.com, or send us a message on Facebook.